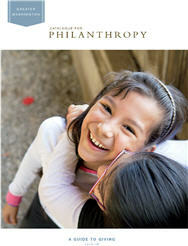 The Catalogue for Philanthropy Class of 2011-2012 has been selected! Check out our 70 new and re-listed charities, as well as those who have been “re-certified” to remain on the web. (Several of whom have grown so much in the past few years that their budget renders them too large for the print catalogue!) Check them out right here. Congratulations! Reactions to the demise of the Kansas Arts Commission — As you likely have read, Gov. Sam Brownback (R-Kansas) vetoed funding for the Kansas Arts Commission over Memorial Days weekend. An override was unsuccessful. But Create Equity does find something of a silver lining: “this controversy has revealed genuine, broad-based public support for funding the arts … the dogfight over the Arts Commission was the top story on the Topeka Capital-Journal’s website. I don’t mean it was on the front page, I mean it was the #1 story in all of Kansas.” In other words, arts have real political power. Maybe more than imagined.